Was in Bački Petrovec, Serbia for a family reunion and saw this during one of our walks in the town square. All comments are welcome. 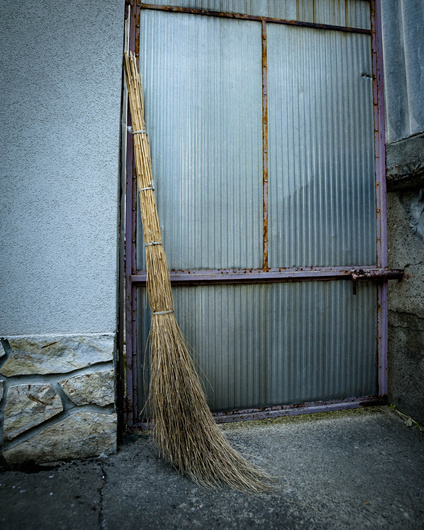 Well as you say it shows a broom by a gate. but that is all the photo shows. The lighting is flat, the composition isn't the greatest. There is no story, there is nothing that brings us an experience of travel. If the broom was used by someone, it would be something else. If the shot would have shown something that is special for Serbia. The good part is that is a sharp photo. Great comments. You are right, there really isn't a story there. Thank you for taking the time. Hmm, I like it, the textures, muted colors, the story is in the shapes, colors, human element of a broom that is obviously foreign, against industrial steel doors, i may have shot it horizontally across the bottom of the frame removing the upper right corner textures.